MANILA, Philippines - The 'April 2017 Midwife board exam results' are out online in 3 working days after the exam. Those awaiting results can check on this page for the list of passers, top 10 (topnotchers), top performing schools and performance of schools as released by the Professional Regulation Commission (PRC) and the Board of Midwifery. 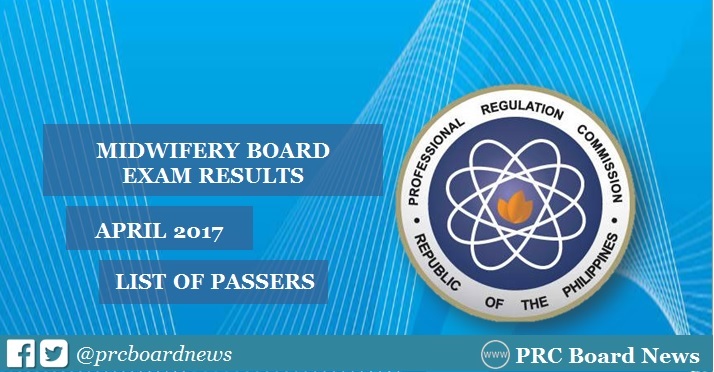 As announced, 965 out of 2,194 (43.98%) passed the Midwife Licensure Examination. The Midwives board exam was conducted on April 10 and 11 in the cities of Manila, Baguio, Cagayan de Oro, Cebu, Davao, Iloilo, Legaspi, Pagadian, Tacloban, Tuguegarao and Zamboanga. The examination was originally scheduled on March 29 and 30 but has been moved in April to give students enough time to secure their Transcript of Records (ToR). The two-day exam covered the following subjects: obstetrics, fundamentals of health care, infant care and feeding (April 10) and primary health care and professional growth and development (April 11). On its original schedule, results are target for the release in just 3 working days. Mapping on new schedule and barring unforeseen circumstances, PRC is expected to release April 2017 Midwife board exam result on Tuesday, April 18, 2017 or in 3 working days after the exam. In the same period last year, PRC released results in just 2 working days after the exam. PRC named 1,055 out of 2,145 who have successfully hurdled the test. Marilou Jumalon Montefalcon from Christ The King College-Gingoog City aced the board with 90.50% grade. Camarines Sur Polytechnic College-Nabua was recognized as the top performing school for having 92.19% or 59 out of 64 passed the exam. In the November 2016 examination, results were out in 3 working days. 1,572 out of 3,085 passed the Midwife board exam. Maribel Doroja Sabenia of Estenias Science Foundation School - Casiguran Sorsogon topped the board with 90.10%. However, none of the schools was qualified for the top performing school list per Commission Resolution No. 2010-547 series of 2010. Note that registration for the issuance of Professional Identification Card (ID) and Certificate of Registration will be done on-line at www.prc.gov.ph. Follow instructions for initial registration. Those who will register are required to bring the following: duly accomplished Oath Form or Panunumpa ng Propesyonal, current Community Tax Certificate (cedula), 1 piece passport size picture (colored with white background and complete name tag), 2 sets of documentary stamps and 1 short brown envelope with name and profession. Successful examinees should personally register and sign in the Roster of Registered Professionals. Examinees may verify their ratings online in few days after the results are released. On this section, enter the required information in the appropriate fields to verify your identity.